All changes are logged - check here for quick links to those you may not have seen. OR: Receive notification of changes as they occur. April 10 2019 Events & Young Farmers' Club pages updated. April 7 2019 Skittles & Skittles Hall of Fame pages updated with Finals Night results. April 3 2019 Results added to Skittles page. January 2019 issue posted to Yarcombe Voices page. Events page updated. March 23 2019 April Agenda posted to Parish Council page. March 20 2019 Skittles & Hall Of Fame pages updated. March 13 2019 March Minutes posted to Parish Council page. Events & Young Farmers' Club pages updated. March 6 2019 Results added to Skittles page. Events page updated. March 5 2019 Rearranged fixture added to Skittles page. December 2018 issue posted to Yarcombe Voices page. February 27 2019 New Ancestral Search (14) added. February 26 2019 Skittles page updated. February 23 2019 March Agenda posted to Parish Council page. February 20 2019 Skittles page updated. February 15 2019 Events & Classified Ads pages updated. February 13 2019 Skittles page updated. February 11 2019 Young Farmers' Club page updated. February 9 2019 Pub sale news posted to Save The Yarcombe Inn News page. February Minutes posted to Parish Council page. February 6 2019 Skittles page updated. February 5 2019 Skittles, Neighbourhood Plan & Events pages updated. February 1 2019 Wassail report added to Messages/News page. Events page updated. January 30 2019 Results added to Skittles page. January 29 2019 November 2018 issue posted to Yarcombe Voices page. January 29 2019 Skittles page updated with change of venue for 6 v 5 (March 5th). January 24 2019 Responses to Metal Detecting report added to Message/News page. January 22 2019 Results added to Skittles page. January 21 2019 Metal Detecting report added to Message/News page. January 21 2019 Events page updated. January Minutes added to Parish Council page. January 20 2019 Amendments made to Classified Ads page. January 16 2019 Results added to Skittles page. January 10 2019 Events & Young Farmers' Club pages updated. January 9 2019 Results added to Skittles page. More data added to Ancestral Search 13. January 3 2019 January Agenda posted to Parish Council page. December 30 2018 October 2018 issue posted to Yarcombe Voices page. December 28 2018 Yarcombe North Shoot photo added to Photograph Page 4. December 23 2018 More data on Ancestral Search 13 added. December 20 2018 New Ancestral Search (13) added. December 19 2018 Results added to Skittles page. December 12 2018 Results added to Skittles page. December 11 2018 Classified Ads page updated. December 8 2018 Historical photos (3) added to Photograph Page 6. December 6 2018 Save The Yarcombe Inn News page updated. December 5 2018 Results added to Skittles page. Events page updated. December 3 2018 November Minutes added to Parish Council page. Young Farmers' Club page updated. December 1 2018 WWI Armistice section added to World War I page. November 29 2018 Neighbourhood Watch page updated. September Issue posted to Yarcombe Voices page. November 28 2018 Results added to Skittles page. November 21 2018 Results added to Skittles page. November 18 2018 November Agenda added to Parish Council page. November 14 2018 Results added to Skittles page. November 11 2018 Young Farmers' Club page updated. November 10 2018 Church contacts updated. November 8 2018 Latest Village Hall Charges loaded to Village Hall page. Events page updated. November 7 2018 Results added to Skittles page. October 31 2018 Results added to Skittles page. October 28 2018 August Issue posted to Yarcombe Voices page. October 27 2018 Venue Square & Compass renamed The Flying Fish on Events page. October 24 2018 Results added to Skittles page. October 23 2018 Walkers' Guide page updated re: status of Yarcombe Inn. October 20 2018 Young Farmers' Club & Photograph Page 6 updated. October 17 2018 Skittles page updated. October 16 2018 Events page updated. October 15 2018 Photograph Page 6 updated. October 12 2018 New Teams and Fixtures spreadsheets added to Skittles page. October 11 2018 Skittles page updated. October 6 2018 Parish Council page updated with October Minutes. October 5 2018 Events page updated. October 2 2018 Events page updated. September 30 2018 Events page updated. July Issue posted to Yarcombe Voices page. September 29 2018 Ancestral Searches page updated (#12). September 29 2018 PowerPoint Demo added to Affordable Housing report on Messages/News page. September 27 2018 Events page updated. September 27 2018 Affordable Housing report posted to Messages/News page. Link added to Parish Council page. September 27 2018 Correction to map on Ancestral Searches page (#12). September 11 2018 Ancestral Searches page updated (#12). September 9 2018 Parish Council page updated with September Minutes. Young Farmers Club page updated. September 8 2018 Email links on Ancestral Searches page updated to send a copy to the Administrator. September 4 2018 Internet Links page updated. Ancestral Search 12 updated. September 3 2018 June 2018 edition loaded to Voices page. Notification of changes request added to Update Log page. September 2 2018 Parish Council page updated with September Agenda. September 1 2018 Ancestral Searches page updated. August 29 2018 Ancestral Searches page updated. Skittles page updated with new 2018-19 Teams spreadsheets. August 18 2018 May 2018 edition loaded to Voices page. August 14 2018 Ancestral Searches page updated. August 13 2018 Events & Ancestral Searches pages updated. August 13 2018 Messages/News page updated with news on Blackdown Hills Transition Group. August 11 2018 Flower Show results & photos added to Photograph Page 3. August 1 2018 Exeter Leukaemia Fund donation noted on Skittles page. July 29 2018 Skittles page updated with 2018-19 Fixtures & Teams spreadsheets. July 29 2018 Neighbourhood Watch page updated with details of Devon & Cornwall Alert system. July 28 2018 Messages/News, Ancestral Searches and Holiday Lets pages updated. July 27 2018 New Holiday Lets page created. July 25 2018 Events & Classified Ads pages updated. July 7 2018 July Agenda added to Parish Council page. YFC Event added to Events page. July 5 2018 Young Farmers Club page updated. June 22 2018 Link to Flower Show Program added to Regular Village Events section on Events page. June 17 2018 News item Yarcombe's Old Railway Carriage Restored updated with link to details of carriage awaiting restoration. June 16 2018 April 2018 edition loaded to Voices page. June 14 2018 New request added to Ancestral Searches page. June 10 2018 2018 Audit Documents and June Minutes added to Parish Council page. June 6 2018 New request added to Ancestral Searches page. June 3 2018 Events page updated. May 30 2018 June Agenda added to Parish Council page. May 29 2018 Flower Show Program added to Events page. May 27 2018 March 2018 edition loaded to Voices page. May 26 2018 Save The Yarcombe Inn News & Events pages updated. Parish Council page updated with AGM & APM minutes. May 16 2018 Parish Council page updated with APM Agenda. Extra venues added to Events page. May 12 2018 Events & Young Farmers Club pages updated. May 2 2018 Save The Yarcombe Inn News & Events page updated. April 28 2018 February 2018 edition loaded to Voices page. April 18 2018 Young Farmers Club page updated. April 17 2018 Events page updated. April 16 2018 Parish Council page updated with April Minutes. January 2018 edition loaded to Voices page. April 15 2018 Message/News page updated with EDDC's proposed car parking changes. April 12 2018 Events page updated. April 10 2018 Links on all Yarcombe Inn pages now go to the Save The Yarcombe Inn News page. April 8 2018 Events, Skittles & Skittles Hall Of Fame pages updated. April 5 2018 Parish Council & Classified Ads pages updated with EDDC's Green Waste Collection Leaflet. April 4 2018 Events page updated. March 28 2018 Classified Ads page updated. March 27 2018 Events page updated. March 26 2018 Classified Ads, Young Farmers Club & Neighbourhood Watch pages updated. March 10 2018 Parish Council page updated with March Minutes. December 2017 edition loaded to Voices page. March 7 2018 Skittles & Skittles Hall Of Fame pages updated. March 4 2018 Message/News page updated. March 3 2018 Skittles page updated. February 27 2018 Parish Council & Skittles pages updated. February 20 2018 Skittles page updated. February 14 2018 Skittles & World Wars (WWII) pages updated. February 13 2018 World Wars (WWII) page updated. February 12 2018 "Save The Yarcombe Inn" pages now accessed via original Home Page. February 11 2018 November edition made available on Yarcombe Voices page. February 10 2018 Young Farmers Club & World Wars pages updated. February 7 2018 Events & Skittles pages updated. February 6 2018 World Wars page updated. January 30 2018 Skittles page updated. January 29 2018 Events page updated. October edition made available on Yarcombe Voices page. January 28 2018 Events page updated. January 26 2018 Ancestral Searches page updated. January 24 2018 Ancestral Searches and Skittles pages updated. January 22 2018 Young Farmers Club page updated. January 18 2018 Skittles page updated, 4 v 3 moved to Feb 13. January 17 2018 Skittles page updated. January 10 2018 Skittles page updated. January 4 2018 All "Save The Yarcombe Inn" pages updated. January 3 2018 Parish Council page updated. December 30 2017 Parish Council page updated with January Agenda. December 29 2017 Events page & Save The Yarcombe Inn pages updated. December 20 2017 Skittles page updated. September edition made available on Yarcombe Voices page. December 19 2017 Young Farmers Club page updated. December 15 2017 Update added on the Save The Yarcombe Inn campaign. December 13 2017 Skittles page updated. December 7 2017 Skittles page updated. December 3 2017 Parish Council page updated with November Minutes. Ancestral Searches page updated. November 30 2017 Ancestral Searches and Skittles pages updated. November 26 2017 Events page updated. November 22 2017 Skittles & Save The Yarcombe Inn pages updated. August edition made available on Yarcombe Voices page. November 15 2017 Skittles page updated. November 10 2017 Events & Young Farmers' Club pages updated. November 7 2017 STYI News & Skittles pages updated. November 6 2017 Narrative added to a photo on Photograph Page 9. November 4 2017 Messages/News page updated. October 30 2017 Latest Fixtures spreadsheet posted to Skittles page. July edition loaded to Voices page. October 29 2017 Classified Ads & Parish Council pages updated. October 25 2017 Skittles page updated. October 20 2017 Parish Council, STYI News & Photograph Page 6 pages updated. October 18 2017 Events, Skittles & STYI News pages updated. October 17 2017 Parish Council page updated. October 16 2017 STYI News, Ancestral Searches, Events & Young Farmers' Club pages updated. October 13 2017 Skittles page updated. October 7 2017 September Minutes & October Agenda added to Parish Council page. October 4 2017 Skittles page updated. October 3 2017 Events page updated. September 30 2017 June edition posted to Voices page. September 28 2017 Ancestral Searches page updated. September 27 2017 Photograph Page 4 & Ancestral Searches pages updated. September 27 2017 Skittles page updated. September 24 2017 Ancestral Searches page updated. September 20 2017 Events page updated. September 19 2017 STYI News, STYI The Future & Young Farmers' Club pages updated. September 17 2017 New Crowdfunder link added to all "Save The Yarcombe Inn" pages. September 1 2017 Classified Ads and Parish Council page updated with EDDC Recycling Leaflet. August 29 2017 STYI News page updated. August 28 2017 Parish Council page updated. August 24 2017 Events page updated. 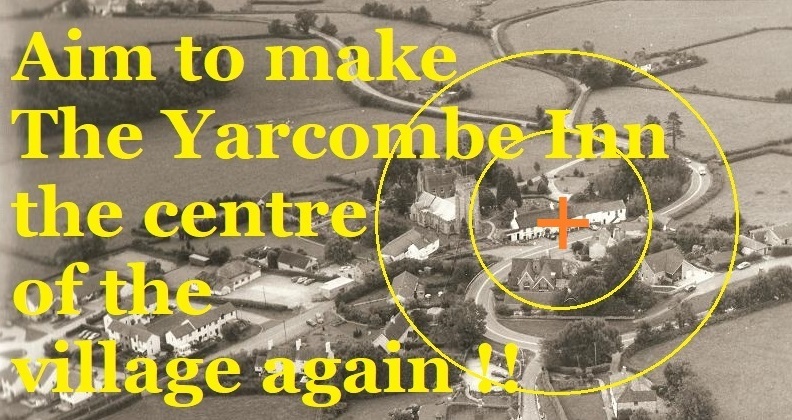 Survey button added to all "Save The Yarcombe Inn" pages. August 22 2017 STYI News page updated. August 21 2017 Skittles page updated. August 19 2017 Yarcombe Inn pages updated. August 18 2017 Latest News, Events and Skittles pages updated. August 15 2017 Skittles page updated. August 11 2017 Young Farmers' Club page updated. August 5 2017 Photographs from the Flower Show added to Photograph Page 3. August 4 2017 May edition posted to Voices page. Ancestral Searches page updated. August 2 2017 Latest News page updated. August 1 2017 Latest News page updated. July 30 2017 Latest News page added to "Save The Yarcombe Inn" pages. July 27 2017 Neighbourhood Plan page updated. July 25 2017 Photo & text added to Home page. Events page updated. July 18 2017 Yarcombe Inn Special Edition posted to Voices and Home pages. July 17 2017 Contact Email addresses added to "Save The Yarcombe Inn" Steering Group page. July 16 2017 More "Save The Yarcombe Inn" campaign pages added. July 15 2017 More "Save The Yarcombe Inn" campaign pages added. July 12 2017 Changes made to Home page for the "Save The Yarcombe Inn" campaign. July 10 2017 Young Farmers' Club page updated. July 7 2017 Agenda & Minutes for July posted to Parish Council page. July 2 2017 Events page updated. June 30 2017 Names added to Home Guard photo on WWII page. June 29 2017 Save The Yarcombe Inn page created & made temporary home page. Classified Ads page updated. June 27 2017 Events page updated. June 20 2017 Photograph Page 6 updated. June 19 2017 Events & Yarcombe Voices pages updated. June 12 2017 Parish Council & Young Farmers' Club pages updated. June 6 2017 Messages/News pages updated with the latest on The Yarcombe Inn. June 4 2017 Events page updated. June 2 2017 Messages/News pages updated. June 1 2017 Parish Council page updated. May 30 2017 Parish Council & Yarcombe Voices pages updated. May 28 2017 Messages/News pages updated. May 25 2017 Parish Council page updated. May 22 2017 Messages/News pages updated with Yarcombe Inn announcement. May 20 2017 Messages/News pages updated. May 16 2017 Events page updated. May 14 2017 Events page updated. May 9 2017 Events, Flower Show, Yarcombe Voices, Young Farmers' Club & WWI pages updated. May 8 2017 Events page updated. April 30 2017 Events & Neighbourhood Watch pages updated. April 27 2017 Churches page updated. April 26 2017 Parish Council page updated with Transparency Payments for 2016-17. April 14 2017 Events page updated. April 12 2017 Young Farmers' Club page updated. April 11 2017 Parish Council and Contacts pages updated with 2017 Parish Information Leaflet. April 9 2017 Skittles & Skittles Hall Of Fame pages updated with end-of-season results. April 5 2017 Skittles & Skittles Hall Of Fame pages updated. March 31 2017 Parish Council, Events & Ancestral Searches pages updated. March 30 2017 Skittles & Skittles Hall Of Fame pages updated. March 27 2017 Ancestral Searches page updated. March 26 2017 Photograph Page 10 transferred to WWII page. WWI & Ancestral Searches pages created. March 15 2017 Parish Council, Skittles & Skittles Hall Of Fame pages updated. March 14 2017 Written Evidence documents posted to Neighbourhood Plan page. Events & YFC pages updated. March 12 2017 Postal Services and Refuse info moved to Classified Ads page. World Wars page created. March 7 2017 Skittles & Events pages updated. March 4 2017 Skittles page updated. March 1 2017 Skittles & Events pages updated. February 27 2017 Classified Ads page updated. March Agenda added to Parish Council page. February 26 2017 February Minutes and new photographs added to Parish Council page. February 22 2017 Skittles & Skittles Hall Of Fame pages updated. February 15 2017 Skittles & Events pages updated. February 11 2017 Parish Council and Messages/News pages updated. February 8 2017 Skittles page updated. February 7 2017 Parish Council and Messages/News pages updated. February 3 2017 Events page updated. February 2 2017 Skittles page updated. January 31 2017 Events page updated. January 30 2017 Skittles page & Fixtures spreadsheet updated. January 28 2017 Events & Neighbourhood Plan pages updated. January 25 2017 Skittles results added. January 23 2017 Internet Links page updated. January 21 2017 January Minutes added to Parish Council page. Events page updated with Feb 3rd event. January 18 2017 Skittles page updated. January 16 2017 Events pages updated with Pub Hub January Event. January 13 2017 Events and Skittles pages updated. January 12 2017 Skittles page updated. January 10 2017 Young Farmers' Club page updated. January 9 2017 Classified Ads page updated. January 8 2017 Neighbourhood Plan page updated. January 7 2017 Neighbourhood Plan page updated. Caption added to picture on Photograph Page 8 (Thanks, Joan Berry!). January 3 2017 More Voices back issues posted. January 2 2017 More Voices back issues posted. January 1 2017 Transparency Code Payments posted to Parish Council page. More Voices back issues posted. Events page updated. December 29 2016 More back issues posted to Voices page. Annual Return for 2015-16 added to Parish Council page. December 25 2016 Photos added to Photograph Page 4. December 17 2016 Old Agendas restored to Parish Council page. December 14 2016 Neighbourhood Watch and Skittles pages updated. December 12 2016 Young Farmers' Club page updated. December 10 2016 Refuse page updated with proper links to EDDC website. Link to EDDC mobile phone app added. December 9 2016 Neighbourhood Watch page amended. Skittles page updated. December 8 2016 Home page amended. New header added to all other pages. December 6 2016 More adverts added to Classified Ads page. Internet Links page updated. December 4 2016 New photograph posted to Home page. New advert added to Classified Ads page. November 30 2016 Skittles page updated. November 28 2016 Churches page updated. November 26 2016 Old agendas removed from Parish Council page. Events page updated with December events. November 24 2016 Skittles page updated. November 23 2016 November Agenda added to Parish Council page. November 22 2016 Events page updated with local venues. Skittles page updated with postponed fixture. November 20 2016 Skittles page updated with results. November 14 2016 Churches, Events and Messages/News pages updated. More back issues loaded to Voices page. November 12 2016 Young Farmers' Club page updated. November 9 2016 Skittles page updated. November 8 2016 Skittles page updated, MLKO match date changed. Events page updated. November 5 2016 Posting of back issues started on Voices page. Archived minutes simplified on Parish Council page. November 2 2016 Skittles page updated. October 26 2016 Skittles page updated. October 24 2016 October Minutes added to Parish Council page. October 19 2016 Skittles page updated. October 17 2016 Events and Skittles pages updated. October 12 2016 Skittles page updated. October 11 2016 Young Farmers' Club and Messages/News pages updated. October 10 2016 Events page updated. October 6 2016 Skittles and Neighbourhood Plan pages updated. October 2 2016 Skittles page updated. October 1 2016 Devonshire Inn Junction Minutes added to Parish Council page.